LOS ANGELES — The darkening prospects for Research in Motion Ltd. are conjuring a nightmare scenario for its nearly 80 million users: What if they woke up one morning to find their BlackBerry phones had become paperweights? Though it may not quite come to that, life as a BlackBerry fan is likely to grow increasingly tough as the device's maker struggles to recover from a financial free fall. RIM's share of the U.S. smartphone market has plunged from 44 percent two years ago to about 12 percent, according to market research firm ComScore Inc. The firm, headquartered in Waterloo, Ontario, has lost nearly 75 percent of its market value since last June. Last week, RIM told investors that it probably will face an operating loss for the current quarter, and announced that it hired bankers from JPMorgan Securities and RBC Capital Markets to help it with a financial "transformation." The company did not say if restructuring would mean selling itself in whole or part, or closing weaker operations such as smartphone manufacturing. Analysts consider it unlikely the firm might shut down completely, especially because many government agencies, including the Defense Department, are using BlackBerry devices. Still, the financial uncertainty swirling around RIM is raising questions about the fate of the millions of BlackBerry devices still in the hands of consumers. didn't think RIM was in danger of immediate shutdown. But in the case that the company did decided to shuck its smartphone business, Dulaney said, "there are people who would want to keep it running and make some money at it." Like many phone makers, RIM maintains an army of computer servers that are crucial to BlackBerry functions, such as email, its BBM messaging service and application store. If the lights suddenly went out at the firm, analysts said, the services would have to be quickly farmed out to other companies to continue working. Marisa Conway, a spokeswoman for RIM, declined to comment on what BlackBerry users could expect if the firm was sold or shut down. Instead, she said, "RIM believes the best way to continue serving its customers and driving long-term value for stakeholders is to execute on its plan to turn the company around." Representatives of Sprint Nextel Corp., Verizon Wireless and AT(ampersand)T Inc., all of which sell BlackBerry devices, declined to comment about how or whether they would support RIM devices if the company was sold or ceased operations. RIM's precarious position has drawn some comparisons with the late Palm Inc., the handset maker whose PalmPilot defined a new category of personal technology in the late 1990s and paved the way for a series of smash hit gadgets. But a decade later, Palm's advantage dissipated in part because of blistering competition from companies like RIM. In 2010, Hewlett-Packard Co. bought Palm for $1.2 billion, an acquisition that two years later has produced few new devices. Analysts have said RIM could face a similar takeover if larger firms are keen to gobble up its subscribers or the substantial cache of mobile technology patents the company owns. Shaw Wu, an analyst at Sterne Agee, said that rather than a takeover, RIM might be in danger of a "take-under," in which the buyer pays a price that is below the current market value of the company. Wu said in a note to investors that RIM's potential buyers could include Amazon.com Inc., Microsoft Corp, Samsung Electronics Corp., HTC Corp., Nokia Corp. and even Facebook Inc., which is rumored to be developing its own smartphone. Though consumers might not see their BlackBerry phones turning off en masse, firms that have designed software apps for RIM devices are facing the prospect of a disappearing market. 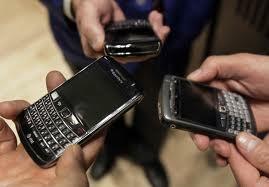 "We hope that RIM will live because BlackBerry is still our No. 1 platform," said Vyacheslav Pilguj, a Ukrainian developer whose Photo Studio photography app has become one of the most popular on the BlackBerry. But that may soon be cold comfort. BlackBerry's App World, which competes with Apple's App Store and Google's Android Market, has failed to catch on widely, attracting only 80,000 apps since it began three years ago, compared with 600,000 for Apple. Moreover, current BlackBerry apps run on a version of mobile software that RIM will soon retire. The company has said the newer version of BlackBerry software will be out toward the end of the year. That system, called BlackBerry 10, is thought to be RIM's last chance to keep its mobile business alive.